Mark & Chappell presents VetIQ Stool Repel tablets. These tablets have been specially formulated to help deter the bad habit of stool eating. 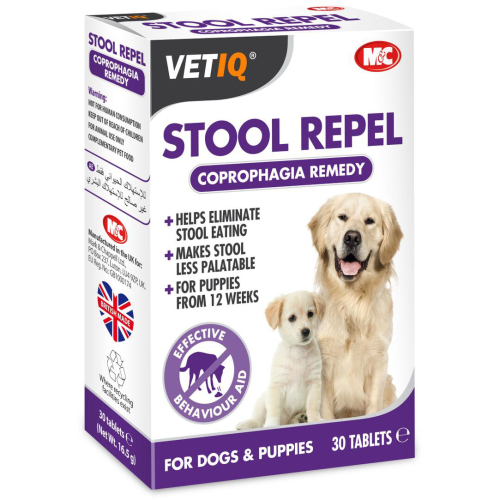 When the active ingredients within Stool Repel are ingested by the animal they become active in the small intestine and help to produce a stool which is unpalatable to the animal. Coprophagia is a behavioural condition with puppies and dogs consuming their own faeces. It is a common habit and can be distressful for the pet owner and unhygienic for the pet. •	Helps eliminate stool eating. •	Palatable chicken liver flavour. •	Safe and very effective. Small dogs upto 5kg 1/2 tab daily, medium dogs 5-10kg 1 tablet daily, large dogs 10-20kg 2 tablets daily.